Just thinking about the recent devastation from flooding in Owego (and other parts of the country) brings tears to my eyes. I do a lot of talking on this blog about our home and our "stuff". I can't begin to imagine the devastation of losing all of it to erratic weather. 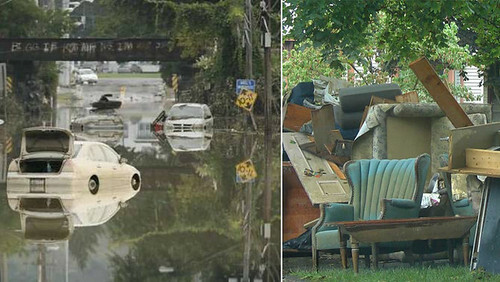 Devastation that continues and continues: as people move their water logged furnishings to the curb so mold doesn't become even more of an issue; as all of the debris, gathered at the curb, becomes a potential fire hazard. Abbey lives in Owego, and when we heard about the flooding we knew we couldn't sit idly by. So here's the deal, to to the Owego Flood Relief site and donate. Your contribution is tax deductible in any amount, but we want to see you give $20 or more if you can. So, if you give at least $20, when you "check out" check the option to send an e-card. Send it to nobiting [at] gmail [dot] com and let us know you donated. We'll send you a $20 gift certificate as a thank you! The gift certificate is good for any print in the shop, and is printable, so even if you don't need any art yourself, you can give it as a gift to someone else. Of course, you'll also get lots of karma and good tingly feelings in your heart, 'cause that's what doing good for others does.